Rubik Asia joins the Catalyst Network bringing Catalyst team building products to the Vietnamese market. Catalyst Global are excited to announce that Rubik Asia have joined the Catalyst Network bringing Catalyst Team Building products to Vietnam. 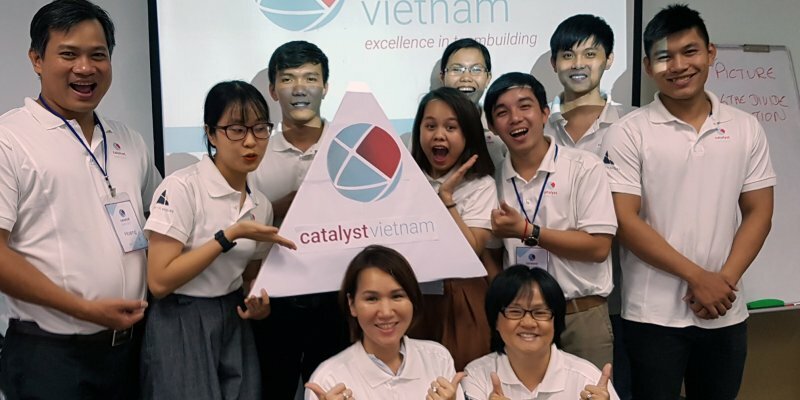 Rubik Asia have rebranded their company to take on the Catalyst name, launching as Catalyst Vietnam. This week the new team at Catalyst Vietnam engaged in an extensive and comprehensive training program. They kicked off getting to know each other and their trainers from Catalyst Global, with a couple of ice-breakers and energisers, ‘Boom Time” and “Knowing Me Knowing You”. They then participated first-hand in many of Catalyst Global’s top team building programs, such as ‘Beat the Box’, ‘Flat Out Pyramid’ and ‘Chain Reaction Table Top’ focusing on sales and delivery aspects to ensure they uphold the Catalyst Global standards of excellence.